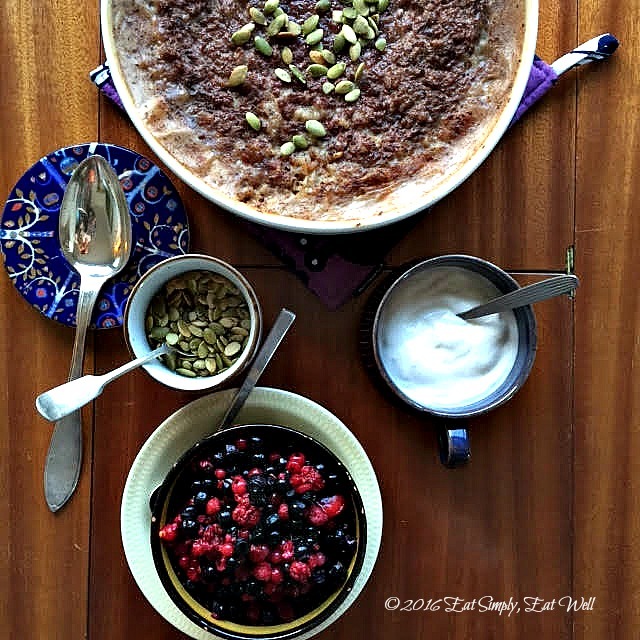 One of the most popular posts on this blog is the Overnight Barley Porridge. I think one of the reasons is the appeal of a one dish meal that basically takes care of itself, provides great flavor and nutrition, works for a crowd, and is super simple to make. So I decided to make another variation on the theme, using oatmeal. 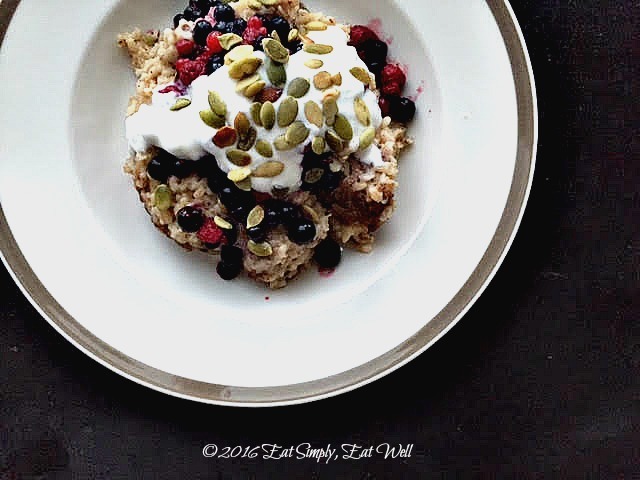 For this recipe, I used steel cut oats, know as “kaurasuurimot” in Finnish. These are unrefined, unrolled oat grain that have the husk removed, but are not rolled, so that the grain retains its shape when cooked in the same way rice does in a risotto. The texture looks good and is a joy to eat: soft, creamy, smooth and warm. Steel cut oats can be found in most grocery stores nowadays. If you are in Finland, Ruohonjuuri and Stockmann Herkku are good places for these, as are some K-markets. If you can’t find steel-cut oats or kaurasuurimot, use the large old-fashioned oat flakes instead. While most baked oatmeals call for using eggs, milk and a LOT of sugar, this one keeps it lean and vegan, using a bit of maple sugar, coconut oil, banana and cinnamon for flavor and sweetness, and flax seeds as a binding agent instead of eggs. I like to top this with berries, a spoonful of yogurt, and toasted nuts or seeds, but I can also imagine this would be amazing with a spoonful of peanut butter and some toasted walnuts, and perhaps a little bit of coconut milk poured over the top. Oatmeal is a great breakfast, full of healthy heart healthy fiber that keeps you going strong all morning long. Add in a big serving of berries, seeds and yogurt, and you have a well-balanced and healthy breakfast with minimal effort. It’s a win-win. Go ahead and make a big batch. This freezes really well for reheating later, or, if you want to prepare breakfast for the entire week, will hold well in the refrigerator for up to one week. Make it now; eat happy every single morning, all week long. Heat the oven to 190°C/375°F. Combine all the ingredients in a 3 liter/3 quart oven-proof ceramic dish. Place the filled dish onto a baking try and place the tray into the hot oven. Bake for 50-60 minutes, or until the top is nicely browned. Removed from the oven and allow the porridge to rest at room temperature for 10 minutes. The porridge will firm up a little during this time. 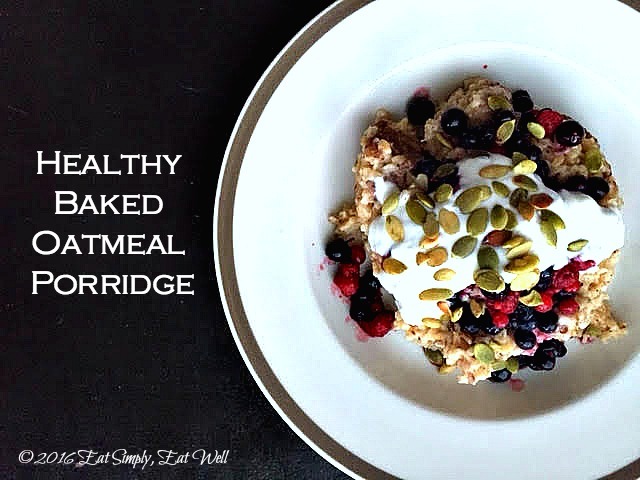 Do you have other great ideas for easy & healthy breakfasts? Let me know in the comments below. Did you like this post? Please share it with your friends. If you haven’t done so already, make sure you sign up for the newsletter so you don’t miss any of the great recipes and tips shared on this blog. Just fill out the form at the top right of this page. I really like the look of this. Thanks. I’m unsure about grating bananas though? I feel like I would end up with more banana on my hands than in the bowl if I grated one … Any tips? Also, I really like the overnight barley recipe which I’m going to try with non-dairy milk. Would this oat recipe work overnight at a lower temperature too?